In Australia, dry conditions are so common that even in the middle of a comparatively wet summer, large swaths of land (especially the desert interior) can remain parched and largely devoid of vegetation. However, as was the case in 2010 and 2011, the summer has shaped up to be a wet one across the eastern portion of the continent. Abnormally high levels of rain fell over New South Wales and Victoria in February 2012, prompting large patches of the desert to green. The map above is based on Normalized Difference Vegetation Index (NDVI) data collected by the AVHRR instrument on the NOAA-18 satellite. 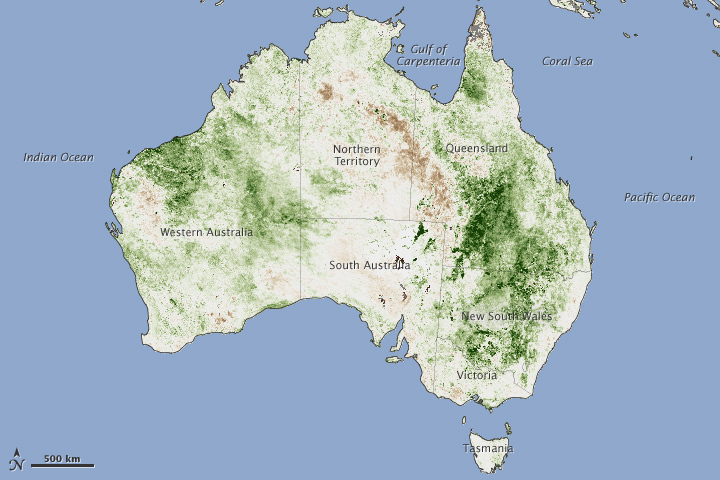 It shows vigorous vegetation growth across eastern Australia, with dark green areas depicting significantly more vegetation than in the 2006–2009 base period. The excess rain will have other impacts. “We”ll likely see bumper harvests for most crops grown in Eastern Australia,” said Assaf Anyamba, a remote sensing scientist with the Goddard Earth Sciences Technology Center at Universities Space Research Association. 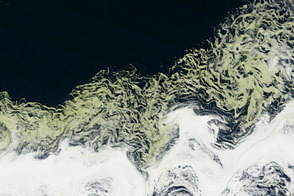 “The rainfall, combined with abundant vegetation, will also create the ideal conditions for the production of mosquitoes that spread Murray Valley encephalitis and Kunjin virus disease.” Already, a reporting system managed by the International Society for Infectious Disease contains numerous reports of the two diseases occurring in humans and horses in 2010 and 2011, when conditions were similar. Early in the month, a monsoon-fueled low pressure area extending from Cape York through central New South Wales triggered intense rain, while in late February, a slow-moving system dumped record-breaking rains on Victoria, New South Wales, and South Australia. The heavy rainfall led to severe flooding in many Australian cities and towns, displacing thousands of people. The Tropical Rainfall Measuring Mission (TRMM) measured 520 mm (20.5 inches) of rain over an area extending from the Gulf of Carpentaria to Cape York Peninsula. Overall, the Australian Bureau of Meteorology reported that February rainfall was 96.7 percent above average in New South Wales, 73.7 above average in Victoria, and 62.9 percent above average in South Australia. 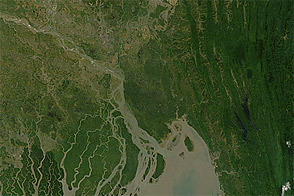 NASA Earth Observatory image by Jesse Allen, using data provided by the United State Department of Agriculture Foreign Agriculture Service and processed by Jennifer Small and Assaf Anyamba, NASA GIMMS Group at Goddard Space Flight Center and the Foreign Agriculture Service (FAS) Global Agricultural Monitoring Project (GLAM) Project. Caption by Adam Voiland. Fires, bumper crops, and encephalitis could follow. Australia Government Bureau of Meteorology. Australia in February 2012. Accessed March 16, 2012. National Oceanic and Atmospheric Administration. State of the Climate: Global Hazards, February 2012. Accessed March 16, 2012.